If I Am Asked To Take The Breathalyzer? If I Am Stopped By the Police? If My Loved One Is Arrested? If Police Come To My House? If I Receive a Summons To Testify Before the Grand Jury? Sanaa Shareef is the 2018 recipient of the Keren Goldenberg Public Interest Scholarship which is awarded to an outstanding college or law school student interested in pursuing a legal career in the public interest. 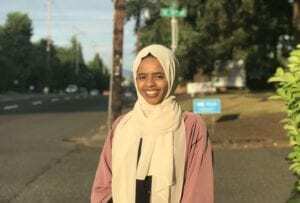 Sanaa is an Honor Roll and Presidential List student at Portland State University who intends to pursue a career in human right law with the United Nations. Sanaa immigrated to the United States from Somalia as part of a family of 12. While learning a new language and navigating a new landscape, she excelled in school and volunteered generously in her community. She received scholarships that allow her to study Portland State University. Sanaa is grateful for her education and wants to use her education to help others. This scholarship was created to help students with limited resources to pursue legal careers in the public interest. Internships with legal organizations that provide these critical services are often unpaid and staff positions are underpaid. Motion for New Trial Allowed!